Our EPA Category IV disinfectant, cleaner and odor neutralizer is effective in all restoration and remediation applications. Designed for general cleaning and disinfecting of hard, non-porous environmental surfaces, it cleans quickly by removing dirt, grime, mold, mildew and other common soils found in hospitals, nursing homes, schools and colleges, medical, dental offices and life science laboratories. Apply to surfaces by spray, cloth, sponge, or mop. Wipe surfaces dry or rinse. Apply solution by spray, cloth, disposable wipe or mop to hard, non-porous environmental surfaces. All surfaces must remain wet for 1 minute. Use a 5 minute contact time for TB and a 10 minute contact for fungi. Wipe surfaces dry or rinse. Pre-clean heavily soiled areas. 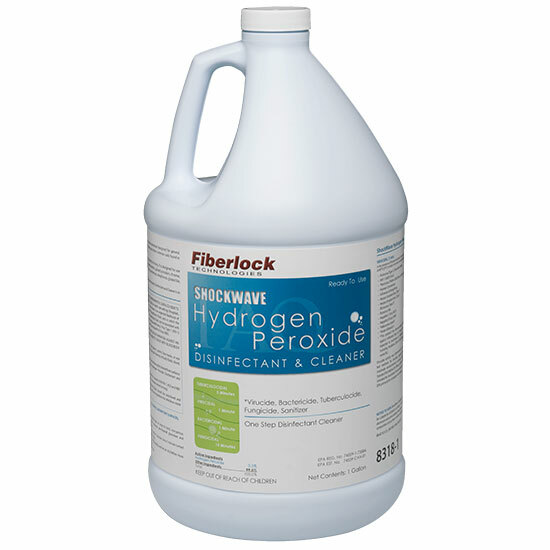 Apply ShockWave Hydrogen Peroxide Disinfectant and Cleaner with a cloth, micro beer cloth, sponge, mop or trigger sprayer to completely wet surface. Allow the surface to remain wet for 10 minutes. Wipe surfaces dry or allow to air dry. Apply to hard non-porous surface; allow to remain wet for 30 seconds. Wipe dry. No rinsing is required. For heavily soiled areas a pre-cleaning is required. Apply solution by spray, cloth, disposable wipe or mop to hard, non-porous environmental surfaces or completely immerse pre-cleaned glassware and compatible instruments in the solution. Immerse or allow the surface to remain wet for 1 minute. Use a 5 minute contact time for TB and a 10 minute contact for fungi. For glassware/instrument: Rinse surface thoroughly and let air dry before reuse. For surfaces: Wipe surface dry or rinse. Change immersion solution after each use.